The height and reach of the steering wheel can be adjusted as required to suit the driver. – Pull the lever ⇒ fig. 129 -arrow- ⇒ up. – Move the steering wheel to the desired position. 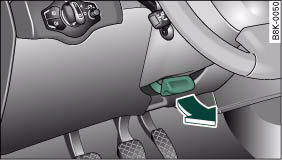 – Then push the lever towards the steering column until the catch engages. • Never adjust the position of the steering wheel when the vehicle is moving - this could cause an accident. • For safety reasons, the lever must be pushed securely against the steering column to prevent the steering wheel from accidentally changing position while driving (accident risk).